I'm generally not a person who LOVES chicken - I'd take beef or pork over chicken any day - but lately, I've been having a serious roasted chicken moment. Maybe it's the weather, the impending fall season, or just the novelty of it but I've roasted two chickens this week and show no signs of stopping. While I love a traditional roasted chicken (like this one), the whole stuffing it, tying it (I get lazy and skip this) thing can be a bit cumbersome. And then there is the issue of crispy skin - everyone knows that the best part about roasted chicken is the crispy skin! With a traditional roasted chicken, the top gets deliciously crispy however, the bottom is always less-than crispy. To fix these issues, enter the spatchcock technique. First, let's all giggle like 7th grade boys at the word spatchcock. Now that we've got that out of the way, let's talk about this technique. It has become my go-to method for making chicken lately because 1.) it cooks a bit faster 2.) it's incredibly easy and 3.) ALL THE CRISPY SKIN. The technique itself is very simple - you just cut the spine out of the chicken and lay it down. Even though that sounds totally serial-killery (yeah, you know it does), I promise it's easy. Since it's impossible to take photos of yourself cutting a raw chicken without contaminating absolutely everything, check out this tutorial. - get a sharp pair of kitchen shears, you really do need them for this! (and be sure to disinfect them afterwards! 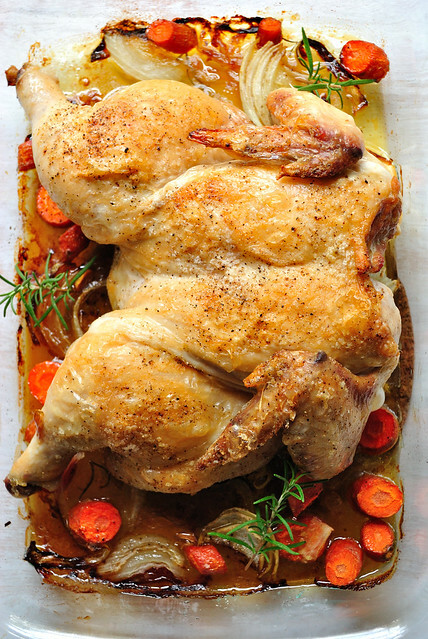 - to cook: place chicken over some veggies and drizzle generously with olive oil. Also, give it a good coating of salt and pepper. I roast mine at 400F for about 45-60 minutes (depending on size). You can also coat the chicken with butter and fresh herbs (DO IT) - if you do that, reduce the heat to 375F and cook for just a bit longer. Time to get roasting! Also, I may have roasted that chicken up there at 9am this morning. Totally normal.